Life is Battle, Battle is Glory, Glory is ALL! 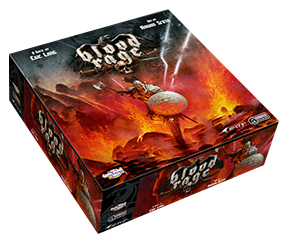 The latest miniature-packed Kickstarter-funded game from Cool Mini or Not is Blood Rage, an action-packed area-control game with just the right mix of trashy Vikings-at-the-end-of-the-world theme and tight mechanics. Eric M. Lang really trimmed the fat off this design, going for a tight three-Age framework that punishes you if you get too far behind, but rewards the experienced player who selects just the right combination of cards. And since those cards are chosen by a draft, you can’t blame the luck of the draw too much if things don’t go your way. Blood Rage looks great, the rules are easy to learn, and the figures – especially the monsters – are stunning. Definitely a game worth adding to your collection. These look fantastic, as always; but there is a small typo in one of the headers. The second expansion is called Mystics of _Midgard_, not Asgard. Otherwise, all looks correct and well. I did on re-read also find a tiny grammatical error. Page 2 (2. Play Cards): “If you reveal _an_ black Upgrade or green Quest card”. I assume this used to read “If you reveal an Upgrade or Quest card” and the colours got added later without substituting a for an. ARGH! I’ll fix it and leave the same version number. The player reference for expansion large version seems to be missing. There’s also no reference to the expansions in the rules summary, only in the player reference. Thanks for all your great work! Sorry, forget that, I was playing with a different layout. Nothing’s missing and I’ve fixed the title page. Played this today. Quick to set up and play. Makes a change. Enjoyed it despite the losing (and mould ruined box). Probably going to play again next week with the Gods and Mystics added. Annoyingly, one of the mystic bases is missing and another doesn’t fit very well (blue ring standard size, so base of figure must be small – I may glue it), but given how much time passed since receiving my KS pledge I doubt cmon will be interested in sending spares.